If you've ever bought green gages from a supermarket in the UK or western Europe, they are almost certainly Reine Claude de Bavay. Don't worry if you were disappointed with the flavour - you can solve that problem by growing your own! Whilst a purist might prefer Old Green Gage, Reine Claude de Bavay also has the distinctive gage flavour, but is easier to grow. Cropping is more reliable, but as with all gages, not heavy. The fruit is medium-sized, and green/yellow when ripe. Rated by Victorian author Hogg as "a first rate dessert plum of exquisite flavour". Please fill in the details below and we will let you know when Reine Claude de Bavay plum trees are back in stock. The definitive English green gage. A popular English green gage, one of the more reliable gages. An American green gage, the best green gage for northern climates. A high-quality yellow-green gage, and usually more productive than other green gages. Lindsey Gage is a sweet-flavoured green gage, similar to Cambridge Gage. Reine Claude de Bavay is in flowering group 3. Reine Claude de Bavay is self-fertile and does not need a pollination partner, although fruiting may be improved if there is a compatible tree of a different variety nearby. Since it flowers in the middle of the blossom season it can be pollinated by most other plum trees. Although easier to grow than many gages, Reine Claude de Bavay still benefits from a sheltered south-facing position if possible. 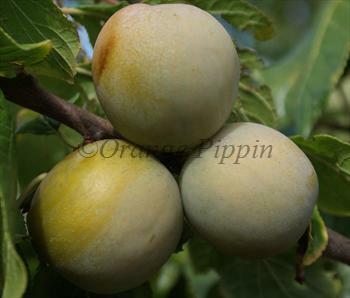 Part of the Reine Claude group of plums, known in France since the Middle Ages. Reine Claude de Bavay is thought to originate from Belgium in the 19th century, and was possibly raised by Major Esperen of Mechelen in northern Belgium, who was also responsible for the well-known pear variety Josephine de Malines.